Last weekend Nick and I traveled to Easton, MD to celebrate our first year of marriage! We got married at The Tidewater Inn last August and ever since our wedding, I've been dying to go back. I emailed our wedding planner to see if we could book a night to celebrate our wedding and she set everything up for us - and it was truly amazing. Our anniversary weekend kicked off the same way most weekends do for us - with a post-work workout sesh and salad on our deck. It's kind of our Friday tradition to just pick up salads and hang out on the couch, and I don't hate it. Saturday morning we both woke up early to get a workout in before heading to the Eastern Shore. I went for a long run and Nick went to play golf with some of his friends. We both got home and showered and packed up and hit the road. We got to Easton a little after 4 and were greeted with a very sweet setup in our room - champagne and chocolate covered strawberries - sent by Melanie, our wedding planner. We popped the champagne, got ready for dinner and headed down to the courtyard of the Tidewater to relax before heading to dinner. 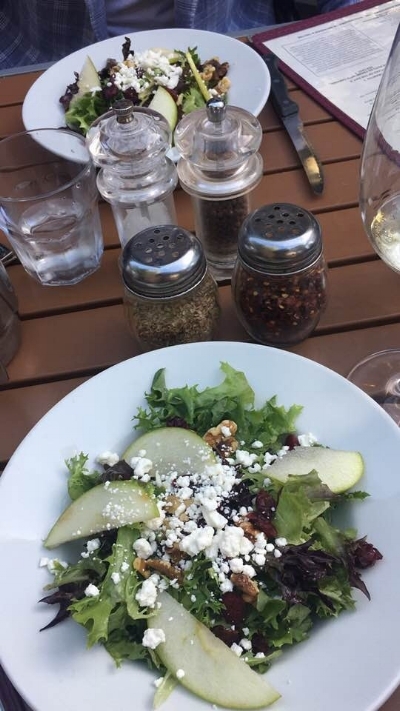 We drove to St. Michael's to have dinner at Ava's, a cute pizza and wine bar that is continually ranked as the top restaurant in town. We started off dinner with another rounds of drinks at the bar and then headed outside to eat. Nick and I both ordered the special salad of the day as our appetizer and pizza for dinner! Veggie pizza for me, margherita pizza for Nick. We spent about an hour and a half just sitting outside eating, drinking and talking about the future. It was so relaxing and the perfect way to celebrate our anniversary! We ended the night with ice cream and some wine back at the hotel before heading to bed. Sunday morning we woke up, ate breakfast at the hotel and then hit the road back to Baltimore. We caught up on our typical Sunday to-do's (grocery store, laundry, cleaning) and then finished off our actuall anniversary with shrimp salad and our wedding cake! We saved the top of our wedding cake and while we were both skeptical about how it would taste, I am here to tell you that it was SO GOOD. Our top tier was chocolate cake with peanut butter frosting so that really shouldn't come as a surprise to you anyways. And that's that! One year down. I can't believe a year has already passed, but am really excited for what year two has in store for us.